"Which Shoes should I wear?" If you have wide or swollen feet it is very important to wear shoes that are wide enough to accommodate your feet and any lumps and bumps you have. If you wear shoes that are too small or too narrow for your feet it is very likely that your feet will suffer and you will get wounds, blisters and/or corns on your feet. Why are my feet so painful? So often I see patients wearing what I consider to be the most inappropriate shoes and their questions are always the same - why are my feet so painful? Shoes too small ... shoes too narrow ... heels too high ... toe box too pointed ... shoes with no support. I could go on. 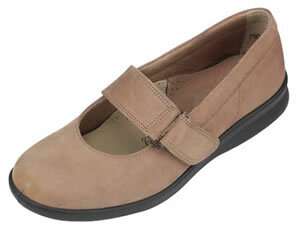 DB Shoes are well made and the same style is available in several width fittings. The added bonus is that they are made in the UK. As a podiatrist I am very happy to recommend DB Shoes. They are available in EE, 4E, 6E and 8E width fittings but not all styles are available in all widths. DB shoes are perfect for people with swollen feet, corns, bunions, hammer toes, claw toes, diabetes, arthritis and extra wide feet. It is important to measure your feet properly so please watch this short video from DB Shoes about using their fitting guide.